The inspiration for Trackathon came when we wanted to build a real time real life gaming app for entertainment purposes. We were intrigued by the idea of having fun and exercising at the same time. Being young as children in the past, our team have all played countless hours of chasing games such as tag and manhunt. However we find that as the rise of technology ever so increases, the new generation of children are playing on their phones. Instead of taking away technology, we decided that it would be an interesting and innovative idea to incorporate technology with fun games to enhance the experience. Trackathon is an application on the app store that allows users to play a special type of tag with other players who have also installed the app. Trackathon utilizes a variety of technologies ranging from the servers hosting the games, to the app. Upon launching Trackathon, the user is able to enter a game with his / her friend(s) or with other people. After, the users will be assigned a role being either a tagger, or the runner. The tagger's task is to catch the runner and the runner's task is to evade the runner within a certain time period. 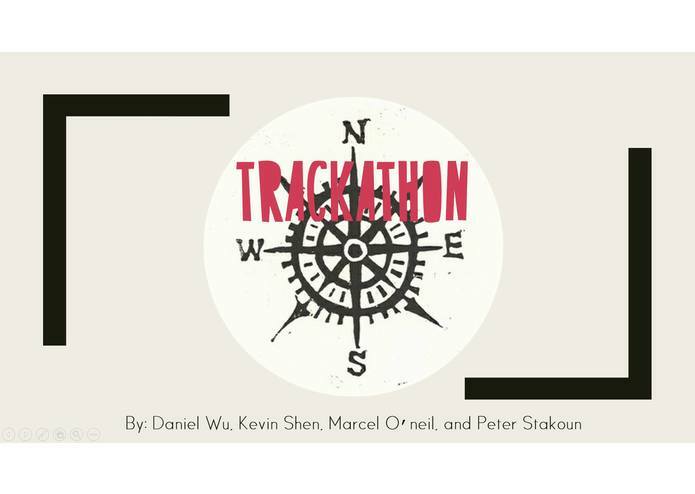 What makes Trackathon so special and unique is that by using your mobile device, the runner will be able to use a compass to track the runner down. This creates a large amount of strategy built towards the game. The runner will have to think like the tagger to evade the tagger and the tagger will have to think like a runner to find the runner. We use a Global Positioning System (G.P.S) to calculate the distance and angle between the runner and the tagger. Within reaching a meter of the target, the runner starts to lose health and upon reaching zero, the runner is officially caught. This adds an extra dimension to the game and allows for a much more longer and strategic game play. As a team, we first devised a detailed plan to ensure that we meet our deadlines and work as a team. We first decided to build the back end and server in preparation for the application and connections. To achieve this, we used the cloud9 service with java which is similar to google docs, but for coding. We then used the Amazon Web Service(AWS) to host the server for the game. For the application we decided to use Android Studio as the development platform for the game. We also used git hub to sync the program / code to ensure that as a team, that we were on the same page. Worked on setting up the workspace and connections in Cloud9 uses Java and debugging process. In addition, I monitored the repositories and workspaces to ensure productivity. Hello! I was the jack of all trades in this project. I worked a bit on this and that, but I really worked on the logistics (eg: distance, angle,and algorithms) and contributed in part of the concept. I worked on setting up the servers back-end, debugging the TCP sockets, as well as transferring the server hosting over to AWS. I acted as the build monitor, and worked on our app's UI and compass system. I also worked with the team on planning and logistics. 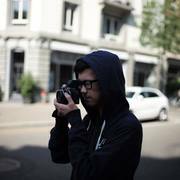 I built the majority of the mobile component and designed the server-client interaction. I also kept the backend code base neat and maintainable, simplifying connections to client sockets.